Today another exhibition is coming to an end. “Contemplation and Compassion” was installed on September 27 at the Gallery and Giftshop of the Hillsborough Arts Council. 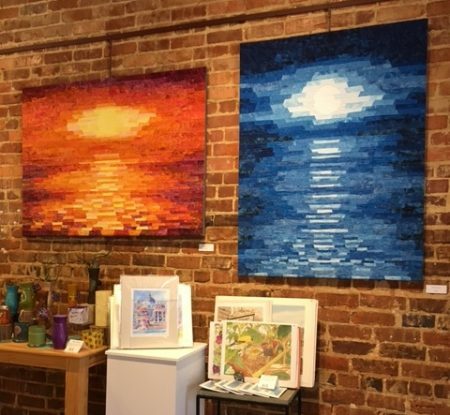 My selection of art quilts was shown together with fiber/wood artwork by Meredith Bridges. 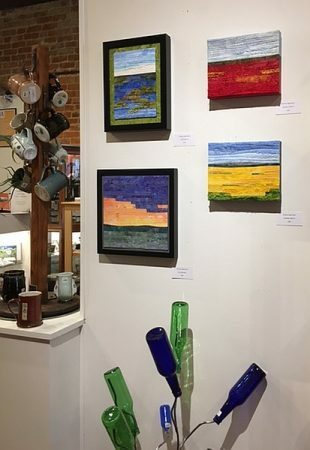 The artists’ reception was during the Final Friday Art Walk and we had 308 people come through the gallery which is a lot considering that the population of the town of Hillsborough is just over 6,000. The Arts Council hosted the reception and there were volunteers at hand to count visitors, serve wine, engage with art lovers and take care of purchases. As exhibiting artist, I could focus on spending time explaining the process of art quilting. Why do you create art? – I hope to facilitate healing and inner peace through my art. Where is the landscape that is depicted in the art quilt? – Frequently, my abstract landscapes are loosely based on places I have visited at some point in my life. Lavender Fields from the Provence, France; mountains and hills from Bavaria, Germany; beaches and sounds from the Outer Banks in North Carolina. Other images, however, originate in my mind and are not connected to any particular location. Do you have a special sewing machine? – No, I use a domestic sewing machine for piecing and quilting. And the all-time favorite question: How long does it take you to make such a piece? – IMHO it does not help telling an inquiring mind that it took many years to acquire the skills I need to make an art quilt. Nor that I spent years collecting all the different fabrics I need for my work. Typically, I work on one piece at a time. Hence, I have a good idea as to how many hours I invest in a piece. I explain the different steps the process of creating my work takes and how time-consuming each step is. By educating the viewer they do not only develop an appreciation for the art form but also an understanding for the price tag. Then they can make a more informed decision when considering the purchase of an art quilt. As I say good-bye to the venue I would like to thank the volunteers at the Hillsborough Arts Council: Jan for her work as the gallery director, Michael for designing the postcard, and all the helping hands during the artists’ reception and the entire duration of the exhibition. Thank you!